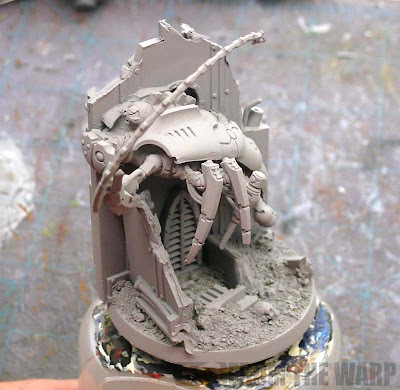 This idea of converting a Necron Wraith to look like it's "phasing in" was not my idea, I only executed it. After talking to one of my friends at my FLGS, he explained to me a cool idea he had for making a few Wraith conversions. He wanted to expand his unit and thought if he made some of them to look like they were phasing in from a piece of terrain, he could use the extra bits in the box along with some careful casting to create a few more models. I thought it was a killer idea as well and he let me try my hand at making the whole idea work. This is what I came up with. It was actually much easier to do than I thought it would be. That being said, there were a couple of things that had to happen for this to work best. The model now sits on a 50mm base instead of the normal 40mm sized base. The extra space was needed to fit the terrain on there. I called up Jeff from Dragon Forge and let him know what I was working on and the idea I was trying to convey. He had the perfect 50mm blank base that I could use. Once I had that, it was a matter of assembling the rest of the pieces. Until recently, I've never been a big fan of "blank" bases, but the more I do with making my own pieces, the more I appreciate having them to work from. The model, or the half that is there was an attempt at casting my friend did. That was all he could get really. I borrowed a single Cities of Death terrain panel (I don't know which set it was from) and cut it up as my wall. Both the model and the wall section required some cleaning and trimming to get them to match as best as possible. Even then, I needed to do some greenstuff work to join them together. I told my friend that the terrain had to be something with considerable detail on it. This would not work with a piece of plasticard or foamboard stuck to the base as the wall. In this case, we aren't building a model that happens to be on a base as much as we're building a base that just happens to have a model on it. We needed to have a very detailed base for this to have a chance at working at all. I used the larger portion of the wall as the part the Wraith would be coming out of and used what I cut off the top as side braces along the underside for added stability. The rest are smaller details I added to make everything look convincing. I added a couple of Secret Weapon skulls to the ground after I added some greenstuff to the corners to vary the height of the ground and make it look like dirt had collected in corners. I used two different sizes of basing material as well for added texture. The first layer was a very fine ballast that covered the whole base. The second layer was a much more coarse material that was added only in a few key spots. All in all, I think it came out pretty well and makes for a cool looking model. 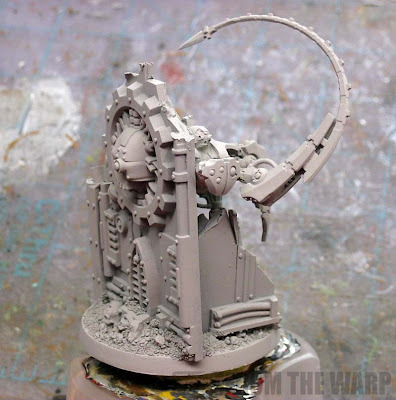 Definitely something that will stand out on the table and isn't your average Wraith conversion. It's conversions like this that make me want to spend a half hour just looking at an army and taking pictures at both larger events and my local shops. Great concept (to your friend) and amazing execution, Ron! Tim: Thanks. I understand exactly what you mean too. I go to my FLGS and love to sit and talk to folks about their armies and what they are trying to create with their conversions and painting. There are some absolutely stunning ideas floating around out there. I hope my friend decides to make the rest of the unit now that he sees it can be done. Very, very cool! That's turned out really well, Ron! Will you be painting it as well? Perhaps some sort of electrical field effect where the model meets the wall to show the effect of it phasing through? Very cool. 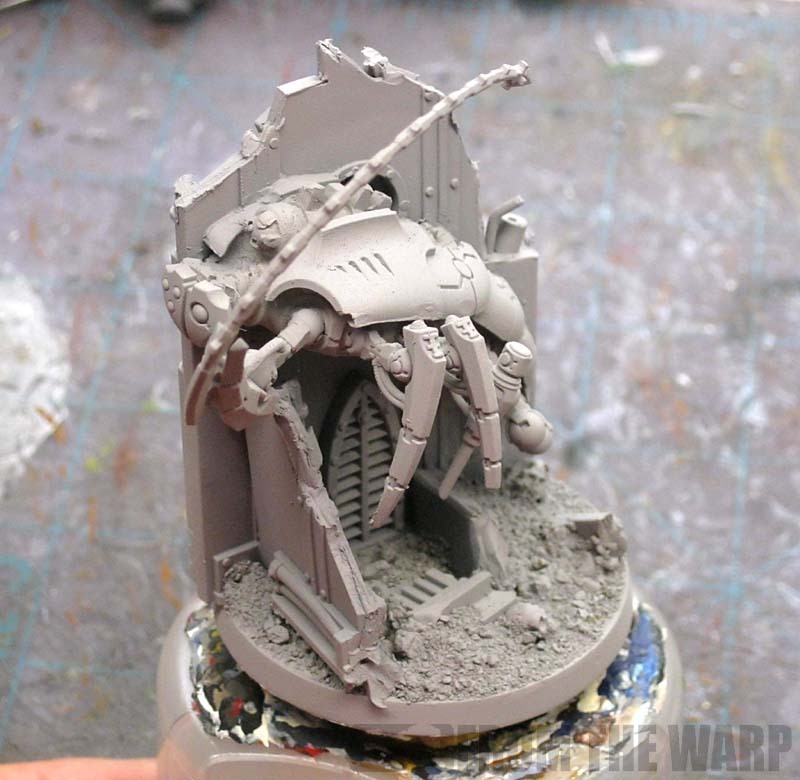 I had done something similar with the old metal wraiths making them look like they were coming out of the ground. I also took the old nightbringer and made it look like he had just taken a swipe with his scythe through a piece of necron obelisk that was in his way with trailing pieces coming off the scythe. It added real movement to the piece. Thank god for more plastic and resin kits! I love trolling the blogs looking at awesome conversions. Mordian 7th: Thanks, I don't think I'll be painting him as I have another project I'm working on that my friend has been patiently waiting for some time now. I agree though, some kind of electrical field would be cool looking to add where the model meets the wall. Zab: The plastic kits make doing this kind of thing so much easier it's silly. 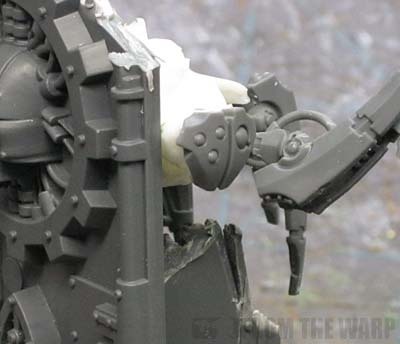 I knew I hated metal a long time ago... now that most things are plastic or resin, I really hate metal models. GSI: Thanks! My next project uses your tool extensively to complete the conversion. I'll have to send you some pics. What's the difference "blank base" and a plastic base from GW? Rushputin: Ummm... nothing? The reason I had to get one here is because of the size. I need a 50mm base because after planning the model out, a 40mm was just a bit too small to do what I wanted and a 60mm dread base was too big. Since I didn't want to try and force the model onto a premade resin themed base, I opted for the "blank" to allow me to build up the terrain exactly how I needed for the model. Short answer though, no difference. I've been looking at these 50mm bases to fit my Tyranid Warrior-Tyrant Guard conversio as I can see that 40mm are too small. dwez: Interesting... I've never heard of them before. I'm actually a bit shy about ordering off eBay. Especially since I've seen what some others go through with some companies. Believe it or not, Monday's upcoming post is an example of this very thing. I suppose it comes down to how well you know a company and the experience you have with them. In this case, I know Jeff and have used Dragon Forge stuff before. If I have any problems, I know he'll take care of it for me. Even if it's as simple as a single 50mm blank base. Ron, first time posting, long time gawker. I hope you take this in the way its intended and not offensively. If you take it offensively I don't blame you. F you! I can't believe you applied a basic idea and pulled it off almost effortlessly. Consider it stolen. I hope to send you pics of my feeble attempts of art imitating life; me imitating you. Thank you for the inspiration! My new Wraiths need something that separates them from the pack and this is it! Thank you so much. In case you missed it the first time. F you! I'm working on mine today. Would it be ok to send you pics, Ron? a Sent One: Absolutely, I'd love to see how your version comes out.